EDWARD DAVIS TOWNSEND. [CIVIL WAR]. 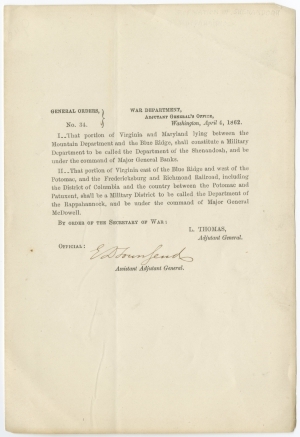 Printed Document Signed, “General Orders No. 34.” War Department, Adjutant General’s Office, Washington, D.C., April 4, 1862. 1 p., 5 x 7½ in. During the war, Townsend was the principal executive officer of the War Department and was more intimate with Abraham Lincoln and Secretary Stanton than any other military official. He originated the plan of a U.S. military prison, and established the prison at Fort Leavenworth, Kansas. Townsend was appointed Adjutant General of the U.S. Army in 1869 and served in that capacity until he retired in 1880.